Almost 100 sizes To Choose From! Remember the last time that you used a wooden cutting board? Did you wonder if all that blood, grease and juice was soaking in and couldn't be cleaned out? Are the bacteria and germs just festering in there? /// ROUND BOARDS, From Our Popular 12" Diameter Mini Chopping Boards To Our whopping 35-1/2 Pound, 36" Diameter Pizza & Cake Board! Excellent For Pizza, Rolling Noodles, Or Carving A Pig! Edges On Both Sides Are Rounded Over. /// SQUARE AND RECTANGULAR BOARDS, From A Small 8" X 8 Onion Board to a huge 36" X 48" Sixty Pound Pig Carver! Great For Small Jobs, Or Buy The Biggies To Cover Your Entire Counter! Good For Ribs, Bread, Large Cuts Of Beef, Etc. Edges On Both Sides Are Rounded Over. /// HEAVY DUTY BOARDS: 3/4" Thick, Twice As Thick As Most Found In Stores! Absorbs The Shock Of Pounding And Hacking. Long Lasting. Excellent as gifts! Rarely Found In Stores. We also have 1/2" And 1" Thicknesses. 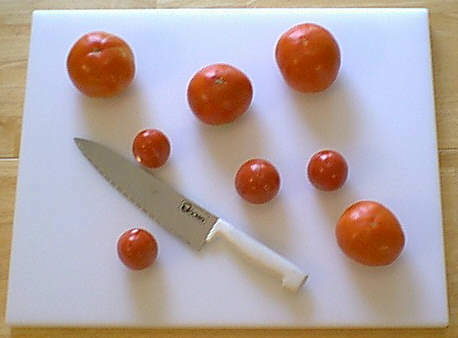 WHITE Cutting Board Material Made From An FDA Approved Resin. Will Not Rot, Crack, Or Split. Dishwasher Safe, Easy To Clean. HIGHEST QUALITY. All Are Custom Made By Skilled Craftsmen. Made in the USA in our factory. These will last and last and last! NO MINIMUM PURCHASE! Many Manufacturers Require You To Buy A "Case", But We Have No Minimum Purchase. Only Need One? That's All You Gotta Buy!